I read this article and found it very interesting, thought it might be something for you. The article is called Chubby, Affluent: India’s New Face of Malnutrition and is located at https://archive.indiaspend.com/cover-story/chubby-affluent-indias-new-face-of-malnutrition-68158. Broadening girths are expanding India’s battle against malnutrition, a new Indian study has revealed, setting off a host of so-called lifestyle ailments. 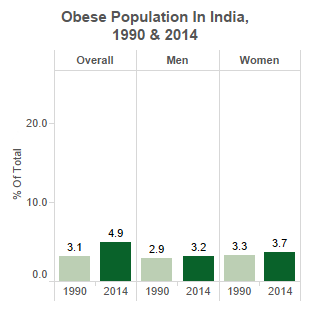 This is happening as India fights a losing battle with the bulge, hosting as it does the third-most number of obese people in the world, 61 million and growing. Malnutrition is commonly associated with emaciated, undernourished people, not with being obese or overweight—or over-nourished, as it is called in dietary parlance. Actually, the ‘over’ in over-nourished relates only to calories, or energy intake. Getting those excessive calories from fat- and sugar-rich, nutrient-poor foods can lead to significant micronutrient deficiencies in obese people, said Carlyne Remedios, senior nutritionist, Centre for Obesity and Digestive Surgery, Mumbai and co-author of the study published in August 2015 in the journal Obesity Surgery. Of 2,740 people with a Body Mass Index (BMI) more than 30 kg/m2, the cut off for obesity, forming the study group, 43% suffered from iron deficiency, 56.7% from vitamin B12 deficiency, 11% from calcium deficiency, 35% from vitamin D3 deficiency and 10% from protein deficiency. A new US study has arrived at a similar conclusion as Remedios. One in five obese patients of that study had insufficient levels of three or more of these micronutrients: vitamin A, vitamin B12, vitamin D, vitamin E, iron, folate (vitamin B9) and thiamine (vitamin B1). Clearly, abundance of food and nutrition are not synonymous. India’s new face of malnourishment is likely to belong to the urban and affluent, those who can afford to choose their diet. Three times more obese and overweight people live in urban areas than in rural areas, as per the National Family Health Survey III. Their numbers are growing almost as fast as the number of undernourished Indians is being contained. 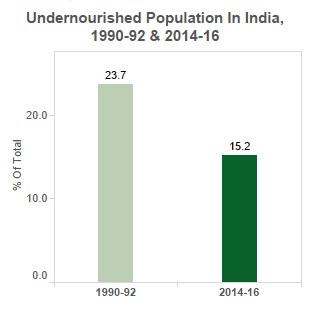 In 1990, 23.7% of India’s population was undernourished while 15.8% was over-nourished. Today, 15.2% of the population is undernourished while 22% is over-nourished. A 28 year-old man, 5 feet 4 inches tall, weighed 100 kg. His diet was overloaded with bad carbohydrates and bad fats, and low in protein. Severely obese, he complained of persistent body ache and pain in the thighs and around the knees. His vitamin B12 levels were low. Investigations showed that the patient was suffering from vitamin D deficiency and high uric acid, findings that are “typical of overweight people”, said the consulting doctor Anil Arora, head of unit and lead consultant, Department of Orthopaedics, Max Super Speciality Hospital, Patparganj, Delhi. A 13 year-old girl, 5 feet 4 inches tall, weighed 114 kg. She consulted a dietician for a weight-loss programme. “Dietary assessment revealed she ate no vegetables, just high-fat and high-carbohydrate foods and a lot of meat, mostly chicken. Overall, her intake of calcium, iron and other micronutrients was low,” said Sherin Verghese, manager, dietetics, Malabar Institute of Medical Sciences, Kozhikode. Blood tests showed the young teen to be borderline diabetic, despite her young age. Research and the experience of dieticians across the country trace a clear correlation between faulty diets and excess weight. 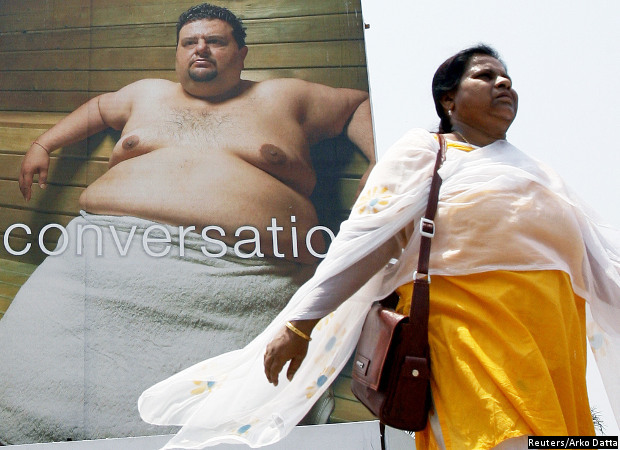 A 2010 study in Gujarat compared the daily diet of overweight people and normal weight people. Overweight people were consuming almost 10% more grams of oil per day and 20% fewer grams of vegetables. In a 2013 survey focussed on women conducted in Delhi, obese women identified fried food as the leading cause for their condition, while overweight women attributed excess weight to overeating. To add to this, metabolic changes associated with obesity can compromise the absorption of micronutrients from food. Technically, obesity is a kind of inflammation, which research has shown impairs iron absorption or iron utilisation. A recent Indian study at St. John’s Research Institute in Bengaluru showed that obese women face an increased risk of iron deficiency, and they also absorb less dietary iron. “Research is yet to fully confirm but we believe that adipose (fat) impedes the utilisation of micronutrients—iron and potentially other micronutrients—by the tissues,” said Remedios. Raised BMI is a major risk factor for non-communicable diseases such as heart disease and stroke, the leading cause of death in 2012, diabetes, musculoskeletal disorders and some cancers—endometrial, breast, and colon, according to the World Health Organisation. Less commonly reported is the association between obesity, nutritional deficiencies and disease. A US study has traced a link between obesity, diabetes and deficiencies of vitamin D, chromium, vitamin B7 (biotin), vitamin B1 (thiamine) and vitamin C.
A 2012 study of 1,765 North Indians diabetics, pegged the overall vitamin D deficiency rate at 76%. It identified progressively worse deficiency in those with higher BMI: 65% in those with BMI less than 23kg/m, 75% in those with BMI 23-27.5 kg/m and 81% in those with BMI greater than 27.5 kg/m. “Overweight people are at higher risk of developing vitamin D deficiency because the vitamin is fat-soluble, which means it gets stored or ‘locked up’, so to speak, in fat cells, with less available to the body for use,” said Seema Gulati, head of the Nutrition Research Group, Center for Nutrition & Metabolic Research (C-NET). Conversely, when fat people lose weight, their serum vitamin D level may increase, said Gulati. Lower vitamin B12 and folic acid levels are characteristic of hypertensive overweight and obese people as compared to hypertensive people of normal weight, according to a 2009 study in Mumbai. Even among people with normal blood pressure, those who were overweight or obese had lower vitamin B12 and folic acid levels than those of normal weight. Obesity can shave off up to eight and a half years of an adult male’s lifespan and six years of an adult female’s lifespan. Obese people also lose two to four times more healthy life years than a person of normal weight. While that is reason enough to lose weight, shedding kilograms isn’t so easy. In the last 33 years, no country has significantly reduced obesity, according to the Global Burden of Disease Study 2013. 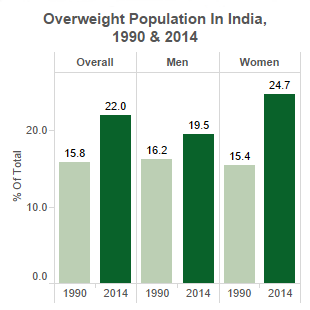 With the prevalence of overweight people in India estimated to increase to 27.8% by 2030, and with the most population growth expected to occur in urban India where obesity is expanding the fastest, experts said public policy should focus on malnutrition at the other end of the spectrum—that presents its own challenges because in India, over- and under-nutrition are not simply a problem of the rich or the poor. “Often, over- and under-nutrition overlap and coexist in the same household even in rural and periurban areas as a result of ‘urbanicity’,” said Sutapa Agrawal, epidemiologist, Public Health Foundation of India. Dual burden households make public health interventions tricky. Strategies to address under-nutrition—such as increasing household food supplies—could contradict obesity curtailment programmes while interventions to address obesity—like recommendations of a low fat diet—may adversely effect any underweight members, said Agrawal. Catch them young before the fat creeps on: create awareness in children through school education programmes that simultaneously address both types of malnutrition, she said.